And all the moms cheer with pure joy. It’s okay, let it out!! In the past, mornings have not been my “thing.” A warm, comfy bed with crisp sheets and an over-sized comforter is what my body and heart crave each morning. Although I’m quite in love with the staying in bed idea, life just seems to be thrown off balance when Mom decides to nestle in the covers for a few extra minutes. Suddenly it’s noon, the kids haven’t enjoyed breakfast and I’m looking at my pjs wondering if I’ll ever enjoy a date in my clean shower (thanks to that amazing DIY soft scrub!) with my homemade body wash. It can be a bit sloppy and a wake-up call at the same time. At the end of 2014, I sat down to reflect on the past twelve months. Part of this reflection included setting clear goals and actions for the new year. Actions that will make life “easier.” Goal number eight is: “Enjoy life. 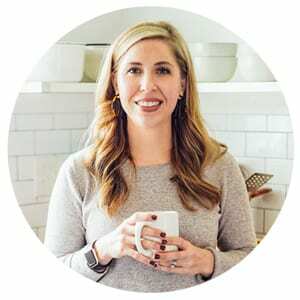 Develop a balance between freelance work, blogging, and family life.” A goal is only attainable with a specific action plan, so actions were developed for making this goal a reality. One of the actions that I knew would help bring more balance to my life was waking up early and using the most important time of the day: the wee hours in the morning. I’m not going to lie. The first couple of weeks were hard and painful, but by the first of February my body started to naturally wake up early, rather than relying on the noise of the alarm clock. With the early focused mornings, I also noticed my day (and as a result my family’s day) appeared to run a bit smoother. The kids didn’t feel stressed in the mornings, and Dustin even started waking up earlier to enjoy coffee and breakfast with me. I see you over there eyeing the cheese, eggs, and tortillas. Hang with me. There’s a point to all this talk, and I promise it ends with a warm burrito! Making breakfast is one of the activities that consumes a ton of my time in the morning. I often turn to my homemade pancake/waffle mix, freezer muffins, and smoothie packs. Ready-made breakfasts save so many busy mornings. 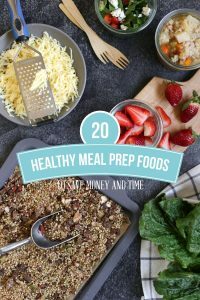 I knew more beloved breakfast recipes could be prepped in advance to help our mornings run a bit smoother. 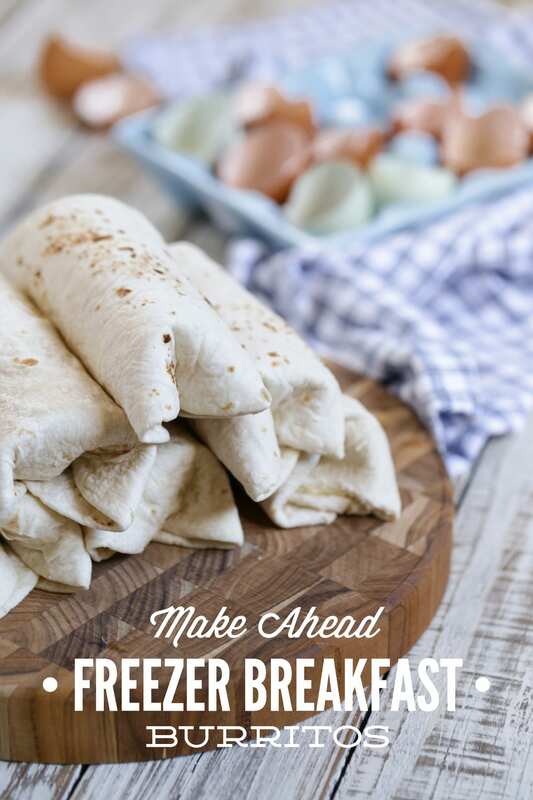 Freezer breakfast burritos have since been added to my arsenal of quick and easy breakfast recipes, along with the carrot cake breakfast cookies I share last week. Breakfast burritos are super easy to make and have always been a favorite in our house. Talk about instant popularity–just offer your family a burrito or cookie for breakfast. 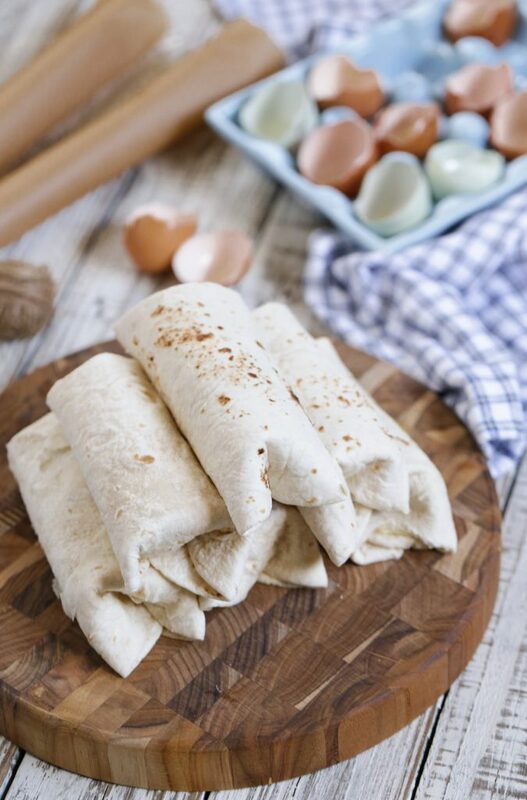 By freezing our favorite burritos, I’ve been able to enjoy the peace of mind that breakfast is taken care of so I can focus on other activities which help our mornings run smoothly. With the time I used to spend making breakfast, a daily morning shower is actually possible!! And we all know that’s no small mommy accomplishment. Breakfast burritos are super easy to make and have always been a favorite in our house. Talk about instant popularity–just offer your family a burrito or cookie for breakfast. 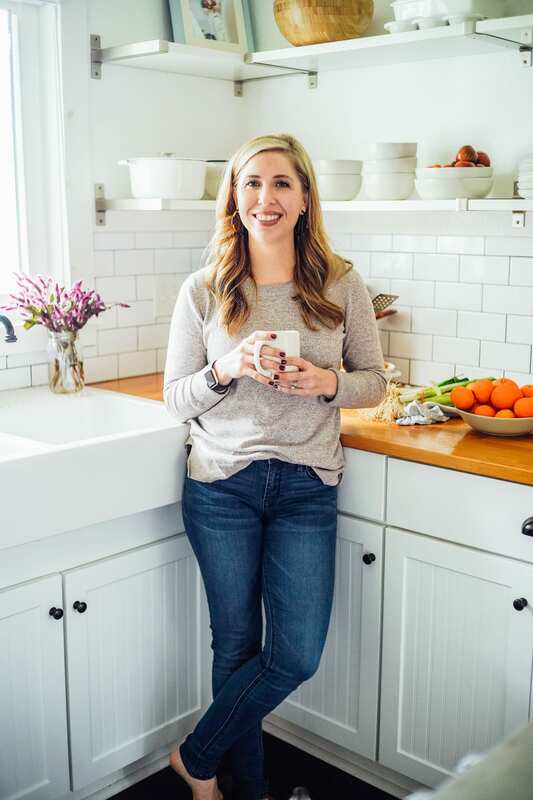 By freezing our favorite burritos, I’ve been able to enjoy the peace of mind that breakfast is taken care of so I can focus on other activities which help our mornings run smoothly. 1 lb ground pork sausage I purchase ground breakfast sausage from our local health food store. 12 flour tortillas I like Stacy's Tortillas sold at many health food stores. In a large skillet (I use a large cast iron skillet), over medium-high heat, brown the sausage for 5 minutes. Make a well in the center of the skillet. Add the bell pepper and sweet onion and cook for 1 minute. Stir the vegetables into the ground sausage. Saute the veggies, mixed with the sausage, until the onions are translucent (about 3-4 minutes). Strain the fat from the sausage and veggies, then place the mixture in a bowl and set aside. In the same skillet, melt the butter. Whisk the eggs and milk together. Add salt and pepper to taste. Pour the eggs into the skillet and scramble until the desired consistency. Remove the eggs from the heat. Add the sausage mixture to the eggs, gently stir to combine the ingredients. To assemble the burritos, place a few tablespoons of shredded cheese (or 1 slice) in the center of each tortilla. Add the egg and sausage mixture. Fold the sides into the center of the tortilla and then roll into a burrito. The burritos can be individually wrapped in parchment paper or foil; or simply place the burritos in a Ziploc bag (my preferred method). 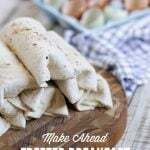 Any tips for using homemade tortillas for freezer burritos? I find that they just crack and break apart. I also have been unable to find acceptable store bought tortillas so I’m kind of stuck. Hey Paula, I would try wrapping each tortilla in a moist paper-towel before reheating. I’ve found this keeps homemade tortillas (and the sprouted variety) from cracking. Hey Hela, Thank you! You can skip the pork, maybe add some sautéed spinach with the onions and peppers for a veggie version? Or potatoes would work well as a pork substitute. Simply boil a couple of potatoes, drain the water, and then cut them into small cubes. Spinach sounds amazing! ….i only use frozen, would that work ? Hela, I think frozen spinach will work, just make sure it’s drained of any water that could cause the burritos to get soggy. That’s what I thought, thanks again for all your wonderful ideas.you are a real inspiration! !…thanks to u I know that I too can one day make a total transformation. You’re so very welcome, Hela! I’m excited for you!! 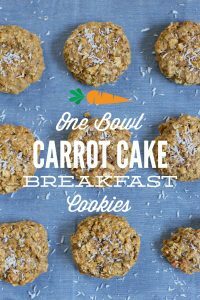 Made these this morning and they were delish! I love freezer friendly food! Awesome, Lindsey! Thank you for sharing. Look out for a couple more freezer-friendly breakfast recipes coming soon :). Hey Kristin, Would you know of a good substitute for eggs? My little one is allergic to eggs so I want to make half with eggs (for me and the hubs) and half without for him. Either way, I can’t wait to try these! Hey Amber, Roasted potatoes may work well. That’s probably what I would use as a substitute…maybe chop them small enough so they are more like hashbrowns. 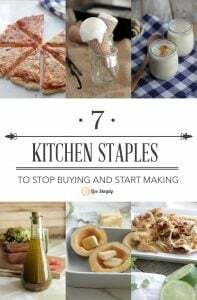 I have recently joined this site and have tried most of the Homemade recipes. The one that I enjoy the most is the Homemade Liquid Laundry soap. I am amazed at how long the laundry soap lasts and when adding a lil bit to a stain w/ lemon juice, letting it sit for 5 minutes. The stain does come out. I always enjoy reading the comments and the emails that I receive. Thank you so much, Tara, for your sweet comment. It’s so great to hear you’re enjoying Live Simply and the laundry soap! How long can you store these burritos in the freezer? Hey Laura, About 3 months. Hey Jo, You can place them in the microwave for about 1 minute on each side. Or you can reheat them in the oven (about 350F) until warm to touch. These are perfect for mornings! But I never froze them. Any suggestions for taking them straight from the freezer to the plate? Hey Devin, That’s so great! I have a vegetarian version coming out soon that’s so good, too. You could try setting one in the fridge overnight to defrost. Another idea is to warm the burrito in a skillet, similar to making a grilled cheese–depending on your pan this also produces lovely grill/toast marks. And if you use a microwave, you can heat the burrito on each side for 1 minute. I am in love with these breakfast burritos, morning life saver! Hi! When taking the burritos out of the freezer, do you microwave them? And for how long normally? Hey Kate, You can, for about 1 minute on each side.